Here are a few basics for how to get started on CB radio. If you are new to trucking or thinking about starting, you have probably already heard of citizens band, or CB radio. CB radio refers to the device and the radio frequency that is used publicly by mostly truckers for communication on the road. Anyone with a connection can broadcast information about road hazards with other truckers, or to have a conversation with anyone listening. Unlike most older forms of technology these days, CB radio has not become obsolete. It is still a useful tool for truckers on the road. Here are a few basics for how to get started. 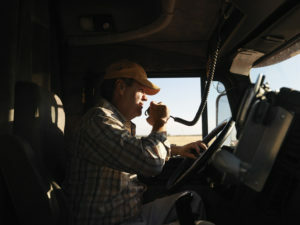 Most, if not all, commercial trucks will already have a CB radio installed. Simply turn it on and use the speaker like a walkie-talkie, by holding the button to talk and letting go to listen. The channel you will need for truckers will typically be 19 or 17 depending on where you are. Because CB radio has a limited signal range, you will need to adjust a knob called the squelch to pick up other truckers nearby. Traditionally, a trucker using CB radio would give themselves a handle, or nickname, to identify themselves. This is because there are usually several people listening and talking on the same channel at any given time. Otherwise, there is an entire language of CB trucker slang that you will learn over time. What you should know to get started is the CB-10 codes. One you are probably already familiar with is 10-4, which is what someone says to let you know that they received your message. Be sure to follow us on Twitter, Pinterest, and Facebook to stay up-to-date on all the latest from Baltimore Freightliner-Western Star. This entry was posted on Monday, March 18th, 2019	at 2:32 pm	and is filed under Trucking Basics	. You can follow any responses to this entry through the RSS 2.0	feed. Both comments and pings are currently closed.